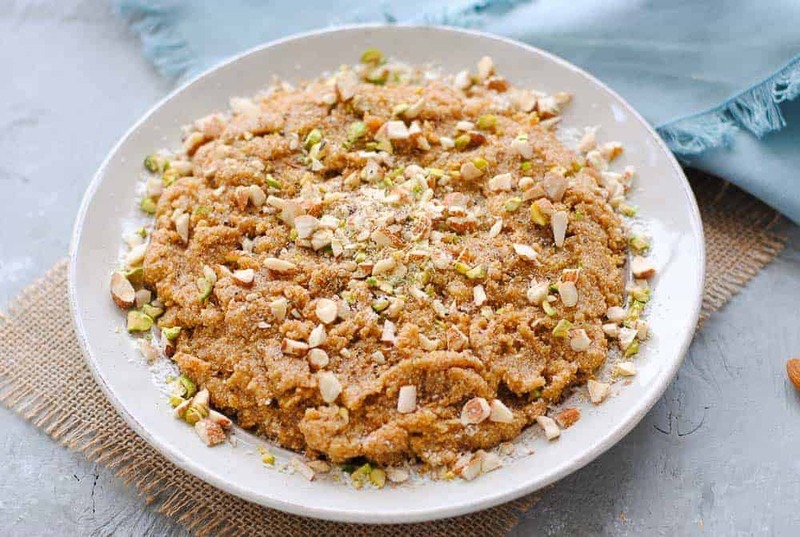 Suji ka halwa is one of the most popular and droolworthy semolina desserts ever. Wonderfully soft and sweet, this sweet confection from India will win you over! Hello suji ka halwa or sooji halwa! 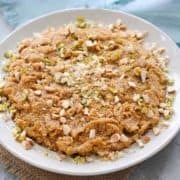 Indian cooking is no stranger to semolina desserts and this halwa is my adaptation of a classic recipe that anyone even remotely interested in Indian sweets would know about. In this recipe, I jazz up the simple semolina halwa with two ingredients that really take it to the next level. Don’t believe me? Just make it for yourself and see. But I’m getting ahead of myself. Before I launch into the details of making it, I must take care of a few FAQs. I’m always asked these whenever I make this dessert, so now’s a good time to answer them. What is semolina or suji flour? Yes, believe it or not, I do get asked this question often, and I’m not surprised any more. Semolina flour is widely used in Indian and middle-eastern cooking, but not so much in American cuisine, I should think, although it is available easily. Anyhow. For the uninitiated, semolina flour is made from grinding durum wheat, the same ingredient that’s used to make pasta. That makes pasta and suji ka halwa cousins, the most unlikely relatives ever! It consists of small, coarse granules and is slightly yellow in colour. Indian varieties of semolina are even paler than the ones available in the West. It is healthier than regular white flour as its nutritional profile is better than the former. Check this article if you want more detailed info. If you are gluten intolerant, you should probably avoid semolina anything since it does happen to be a form of wheat. What is halwa made of? 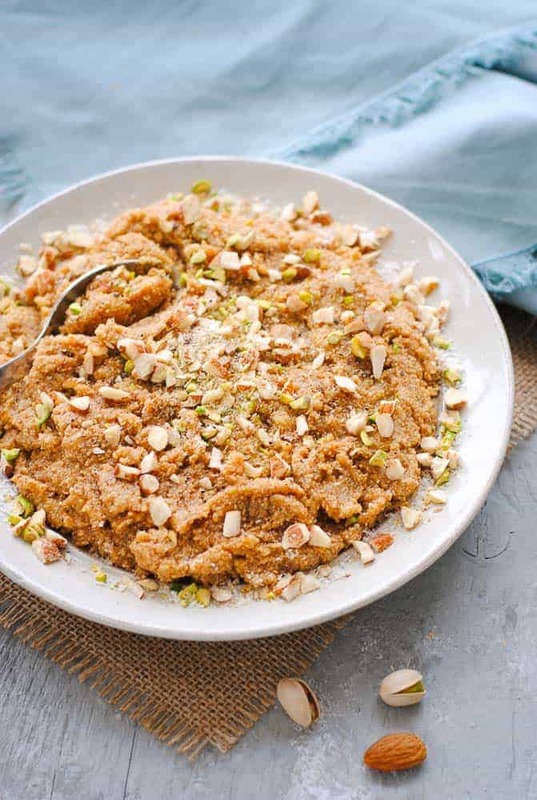 In case you are unfamiliar with halwa, it is a broad term used for rich and dense desserts made with one main ingredient plus ghee, sugar, milk (though not always), nuts, and spices like cardamom. 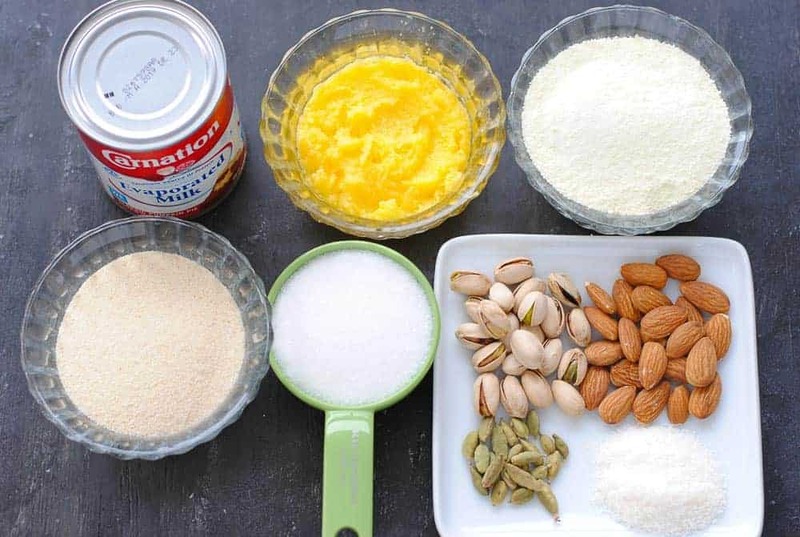 The main ingredient can be anything from flours like semolina and wheat to carrots, dates and even eggs! Yes, egg halwa is quite delicious. Surprising but true. Okay, so now that that’s out of the way, let’s get down to the suji halwa making process. How do you make suji ka halwa? In its simplest form (familiar to most people), this halwa is made without milk. Suji or semolina is dry roasted in a pan until it turns medium brown in colour and then cooked in water, ghee and sugar. Nuts like almonds are also added sometimes. The semolina absorbs the water pretty quickly and becomes a fluffy, soft mush called halwa. It’s made in minutes especially if you have the dry, roasted semolina at hand. Nothing too fancy but it is quite nice to eat, especially when you have a craving for something sweet but quick. Step 1: Dry roast the semolina flour in a pan until it turns brown in colour. It gets roasted in 5 minutes but you do have to keep stirring it continuously to prevent burning. Step 2: Divide the nuts (almonds and pistachios) into two equal halves. Chop one-half of the nuts coarsely for garnishing later. Grind the remaining nuts and cardamom in a spice grinder. You can do the nuts first and then the cardamom or both together. It doesn’t matter as it’s all going in the same cooking pot at the same time. Step 3: Heat the ghee in a heavy and deep bottomed cooking pot and add all the ingredients except the chopped nuts. Cook on low to medium heat for 10-12 minutes or until the halwa becomes thick and starts leaving the sides of the pot. You will have to keep stirring continuously to prevent it from sticking to the bottom, and it will get harder to stir as it thickens, but keep at it! You don’t want a burnt mess on your hands. It’s done when you can’t stir any more and it has thickened quite a bit. 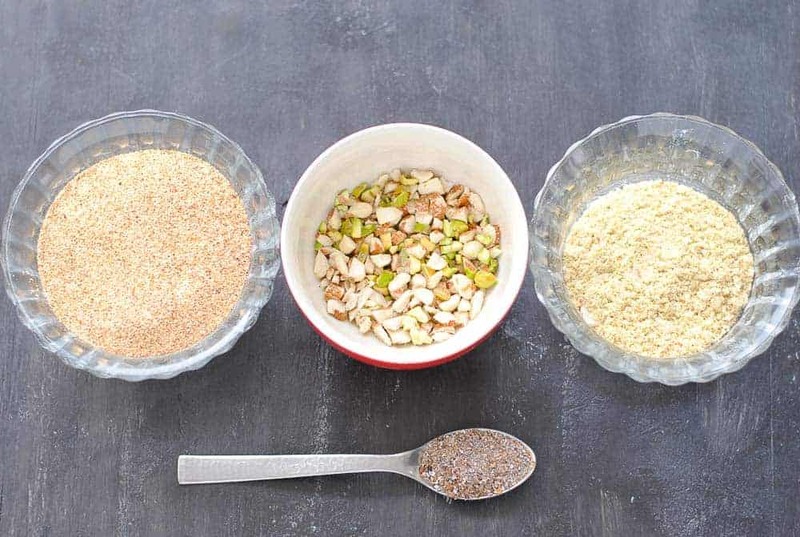 Step 4: Take out the halwa in a shallow dish and garnish with the chopped nuts. Serve warm. This halwa keeps in the fridge for a few days. When you want to have it, take out some in a bowl and microwave for a few seconds. It will be good to eat! Want another great halwa recipe? Check out this carrrot halwa of mine. If you liked this recipe, don’t forget to give it a star rating below! Such fantastic flavours, I love Indian desserts although rarely make them at home… I must give this a try! Do try it Neli. Usually, kids love it because it’s so pleasantly sweet and soft. Ive never had anything like this before, but it sounds incredible! The flavors sound so amazing. Of course we have semolina flour here in Italy and I’ve used it to make pasta but not Halwa. Love the sound of this Indian dessert. 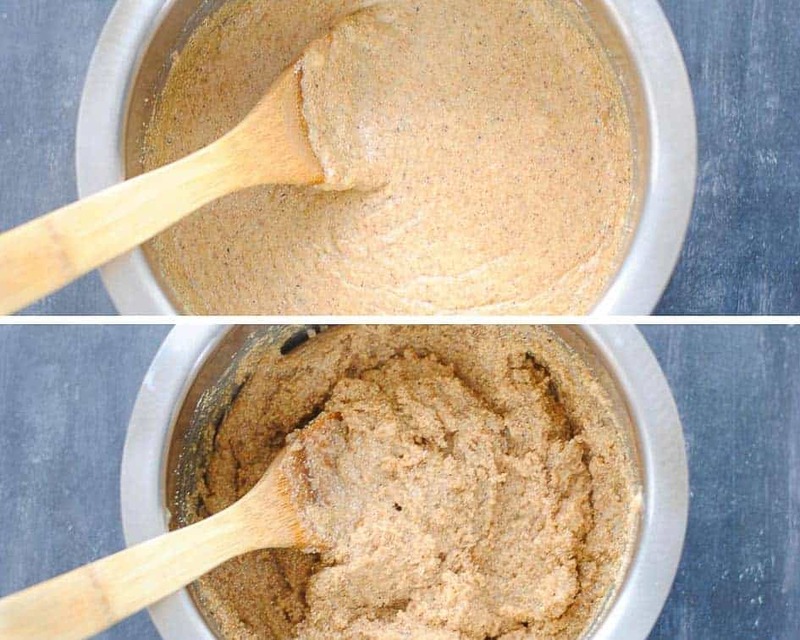 Going to pin for later and try it soon! Oh, do you make pasta from scratch? I’ve never tried that but would love to! This looks like such a rustic and tasty dessert. I have never tried this before. I am always game to try new things. I’d love to try making a homemade halwa one day soon. This one looks delicious and so pretty too. What an interesting recipe! I love discovering new facts about food. This dessert looks absolutely delicious, I can’t wait to try it out! I have never heard of Suji Ka Halwa! That’s one thing I love about the internet, is that you can learn so much about different cultures and the food they eat. This dessert looks scrumptious and right up my alley. I love the addition of nuts! I totally love Suji Halwa. It’s perfect for the cold weather next week, I an looking forward to trying your recipe. Yes, it does taste so good on cold winter days, doesn’t it? Thanks, Amita. You managed to answer every single question I had about this dish! Thank you so much!!! And, I love that combo of nuts you used! Glad I was able to preempt your questions! 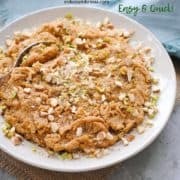 Nuts do make this halwa special! I love them too. I’ve never tried this before but it sounds so interesting. I love the combo of flavors too! I think I never heard or tried semolina before. This recipe sounds so interesting. Flavors are amazing. I must give it a try . I’m saving this recipe for later. I love trying new things. I’ve never heard of this recipe, but I love trying new things from other cultures. I love Indian food, so I’m surprised this dessert has never come up before for me! I haven’t had many Indian desserts, but in general it’s my favorite cuisine for dinner. Really interested to to this. Looks like what we in the states would call a crumble. Excited to try this! This is comfort food for winter days, and I’m craving for some halwa now, hehe! Your photos are so gorgeous!